Glastonbury Festival has always held a special place in my heart. Formally entitled “The Glastonbury Festival of Contemporary Performing Arts”, though dubbed simply “Glasto” by many, the festival is the world’s largest green-field music and performing arts festival in the world, and has been going since the 70’s. I first went to Glastonbury in 1998, when I was just a kid, and I remember being enthralled by the experience, with the festival leaving a lasting impression on me – as I am sure it does to anyone who experiences their first Glastonbury. 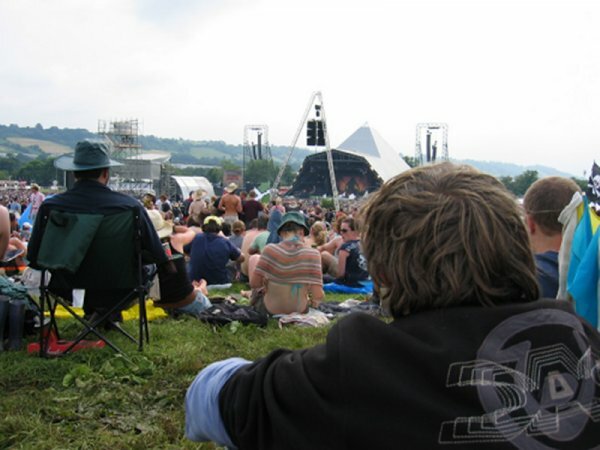 Myself at Glastonbury Festival 2005, overlooking the Pyramid Stage in the distance. “It’s like going to another country, a hip and thrilling Brigadoon that appears every year or so”, states the Glastonbury Festival website under the tab “what is Glastonbury?”. This is a fairly accurate description of the festival for those that have not yet experienced Glastonbury. For you do not visit Glastonbury, instead, you experience it. Unlike many other festivals such as Reading/Leeds festival, Glastonbury’s charm is hinted at in its title: “The Glastonbury Festival of Contemporary Performing Arts”. I cannot and will not attempt to list the countless unforgettable aspects and areas of Glastonbury Festival. Besides, this post is to give an overview of the timeline of Glastonbury, rather than an in-depth discussion of its aspects. However, it is important to note that it is not just another music festival. Glastonbury Festival is huge, and caters for everybody. As its website proclaims: “The Festival has distinct socio-geographic regions”, which range from Dance fields to Acoustic areas, from Jazzworld to Circus and Theatre fields, from the main Pyramid and Other stages to more chilled out areas. A huge part of the Glastonbury experience is simply exploring the enormous Festival, which stretches over a mile and a half across, with a perimeter of eight and a half miles. The Field of Avalon, the Tipi Field, the Green Field, the Field of Lost Vagueness (which I believe may have been re-named since I last visited) and the Stone Circle are just a few chilled out, interesting and perhaps spiritual areas that Glasto-goers can stumble across as they roam the vast landscape. And all throughout the festival itself are art pieces, sculptures, performers, surreal landscapes, impromptu theatre acts… and then there’s the music itself, which actually can often take a back-seat in the festival experience as there is simply so much to explore. Nevertheless Glastonbury always has a diverse line-up of acts from the unknown right up to the superstars. Acts such as The Cure, Massive Attack, Pulp, Blur, Hawkwind, The Smiths and David Bowie (to name but a few) have all performed at the legendary festival over the years. Although entitled “Glastonbury Festival”, the festival itself actually takes place at “Worthy Farm” six miles east of Glastonbury town, between the villages of Pilton and Pylle, though it is overlooked by the mystical Glastonbury Tor. The first festival at Worthy Farm took place on 19th September 1970 and was entitled the “Pilton Pop, Blues and Folk Festival”. Organised by Michael Eavis, owner of the farm and fields, it was attended by 1,500 people. The price? £1 including free milk from the farm. The headline act was originally meant to be “Wayne Fontana and the Mindbenders” who were replaced at short notice by “Tyrannosaurus Rex”, the popular rockers who came to known as “T.Rex”. It was not a huge success but Eavis endeavoured to press on with his festival, which allegedly started out because the farmer wanted to pay off his overdraft, according to the BBC. In the summer of ’78 an unplanned, unorganised Glastonbury Festival emerged. A convoy of vehicles from the Stonehenge Festival were led to Worthy Farm under the impression that a festival was taking place. Due to this misunderstanding, a free festival sprung up after discussions and Glastonbury was reborn. However, it was not the revival of 1971’s magnitude – only around 500 people showed up and there was little organisation and few facilities. However, the free festival went on with the stage being powered by an electric meter in a caravan. A far cry from the monumentous festival that Glastonbury is today. 1981 saw the first incarnation of “Glastonbury Festival”, as it was entitled. Yes, this year the “Fayre” became a “Festival” as Michael Eavis took charge of the festival for the first time. The “theme” this year was nuclear disarmament, and the festival itself was organised in conjunction with the Campaign for Nuclear Disarmament (CND). A new Pyramid stage was built – this time as a permament structure which was constructed from telegraph poles and metal sheeting, repurposed from Ministry of Defence (MoD) materials. 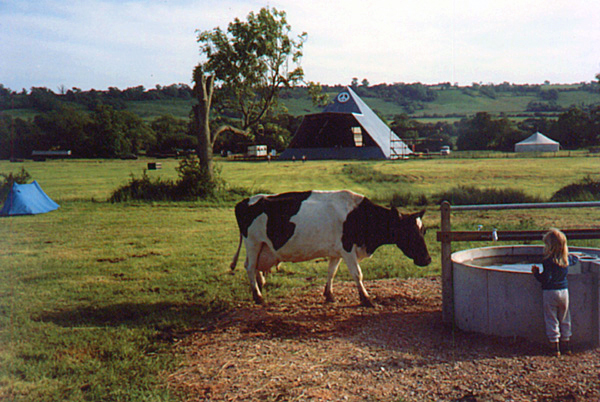 During the winter months, the Pyramid stage would double as a hay-barn and cow-shed. With the new Pyramid stage and proper organisation, the first “real” incarnation of Glastonbury Festival saw over 18,000 attending. Acts included Hawkwind, Taj Mahal and New Order to name but a few. With ticket prices rising to £8, this was the most expensive festival yet but was still a far cry from the £175 + fees that festival-goers are paying today. Eavis was able to hand over around £20,000 to the CND at the end of the three days, with 1981 becoming the first year that the festival actually made profit. It also the year that saw the emergence of the annual Glastonbury Festival – a recurring summer festival that grew each subsequent year. This year saw attendance rise to 25,000. The Festival had truly taken off. Again CND were involved in the running of the festival and ever since, charitable and activist organisations have been part-and-parcel of the Glastonbury experience, with beneficiaries such as Oxfam, Greenpeace and WaterAid all becoming permament features of the festival, providing features and volunteers who work at the festivals in exchange for free entry. Ticket prices were once again £8 and acts such as Van Morrison, Jackson Browne and Roy Harper featured on the bill. ’83 saw the attendance figures rise to a landmark 30,000 – though the figures could have potentially been much higher. The government introduced a Public Entertainment Licence which set a limit on festival-goers. A limit of 30,000. Fortunately for Glastonbury Festival, the limit grew each year. Today over 100,000 festival-goers flock to Glastonbury for the sights and sounds. 1983’s festival raised around £45,000 for CND and local charities, and the festival’s own radio station, Radio Avalon, was established. Ticket price rose to £12 with programme prices of 80 pence, and acts such as The Beat, UB40 and Curtis Mayfield graced the festival. Over 60,000 attended Glastonbury ’86. Additions to the farm office, communications, welfare and medical teams were made to accommodate the growth. The market areas were relocated to the top of the site and the Theatre and Childrens Areas moved to new locations. The first Classical music tent was also added to the festival. The Cure, Madness, Simply Red, The Housemartins and the Pogues all played this year’s festival, which saw around £130,000 being raised for CND and local charities. Tickets were now £17 with programmes reaching £1. The council decided to overturn Glastonbury’s licence in 1987 – a decision that was finally overturned in May, leaving just around a month to sort out the festival. Glastonbury returned from 19th – 21st June and saw the addition of the Womad stage. £130,000 was raised for CND and charities, and once again over 60,000 attended. Elvis Costello, Robert Cray, New Order and Van Morrison all attended, and tickets rose to £21. However in 1988 Glastonbury Festival did not take place as organisers decided to take a breather and to review problems with the festival, namely the increasing size of the crowds. From its “humble” incarnation in 1970 as the “Pilton Pop, Blues and Folk Festival” which saw around 1,500 attendees, Glastonbury had established itself as an annual affair boasting 60,000 + visitors each summer. This figure was only set to grow each year, and the organisers knew that they had to deal with the expanding festival. Glastonbury returned in 1989 although there were, once again, complications regarding the festival licence. The local council appeared reluctant, and for this first time the Police were brought into the organisation and planning of Glastonbury Festival. Attendance grew to 65,000 and tickets rose to £28. Programmes doubled to £2. Elvis Costello and Van Morrison graced Glasto once more, accompanied by the Pixies and numerous other acts. Glastonbury Festival took on its full title this year: the “Glastonbury Festival for Contemporary Performing Arts”, to reflect the diversity of attractions and entertainment throughout the festival. 70,000 attended the festival to see acts such as The Cure, Happy Mondays and Sinead O’Connor. Tickets rose to £38 with programmes priced at £3 – quite a mark-up from 1989’s prices. This year a professional car parking team was employed and a new security team was present. Unfortunately the festival ended with violence between security guards and new age travellers. A “battle” ensued which became known as the “Battle of Yeoman’s Bridge”, leading to 235 arrests and an estimated £50,000 worth of damage. As a result, Glastonbury Festival did not take place in 1991 as organisers took the time to re-think and re-organise the festival. Glasto returned in ’92 to see an expanded festival which proved to be a great success. 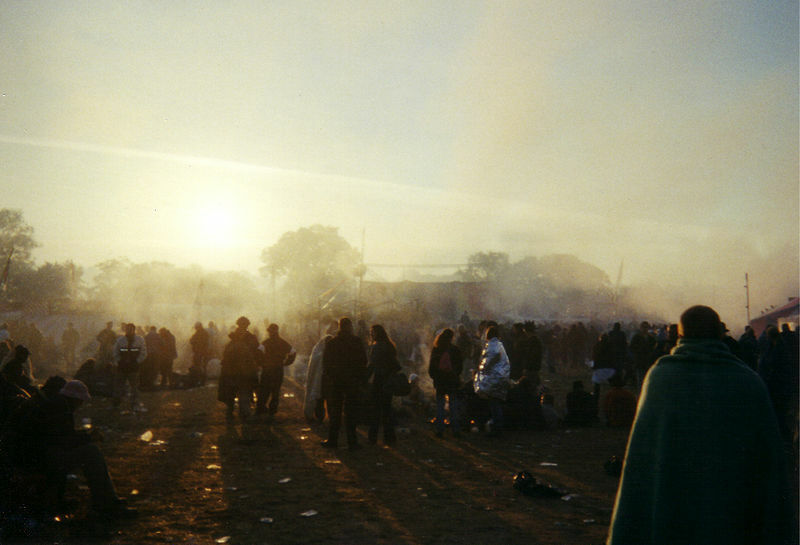 ’92 was the first year that new age travellers were not initially allowed onto the site free, perhaps due to the violence that occurred at the end of 1990’s festival. A sturdier fence was designed to encircle the perimeter. This was also the first year that a percentage of the festival profits went to Greenpeace and Oxfam. Again, 70,000 attended the festival although ticket prices shot up to £49, with programmes costing £4. Primal Scream and The Levellers were just two of the acts playing this year with Tom Jones making a guest appearance. Around £250,000 was donated to Greenpeace, Oxfam and other charities this year. The success of 1992’s festival continued through to 1993 which saw advance tickets selling out in mid-June. The festival was growing stronger each year and over 80,000 festival-goers attended ’93’s event. Again, £250,000 was raised for Greenpeace, Oxfam and other charities. Bands playing this year included Lenny Kravitz, Velvet Underground, The Orb, and Rolf Harris!! Ticket prices again shot up, this time to £58 – more than likely to compensate for the costs of the ever-expanding festival, though still a far cry from today’s prices. 1994 was an eventful year for the festival. On 13th June 1994, just weeks before Glastonbury Festival was due to begin, the Pyramid Stage burnt down in the early hours of the morning. Fortunately a temporary replacement was provided and the show went on. This year saw the introduction of a wind turbine, which helped provide power to the main stage. This year also saw the festival’s first televised appearance – Channel 4 televised the event live over the weekend, increasing the appeal of the festival to a wider crowd. Unfortunately 1994 saw the festival’s first death when a young man was found dead due to a drugs overdose. There was also a shooting incident on Saturday night involving five people – luckily no-one was badly hurt. 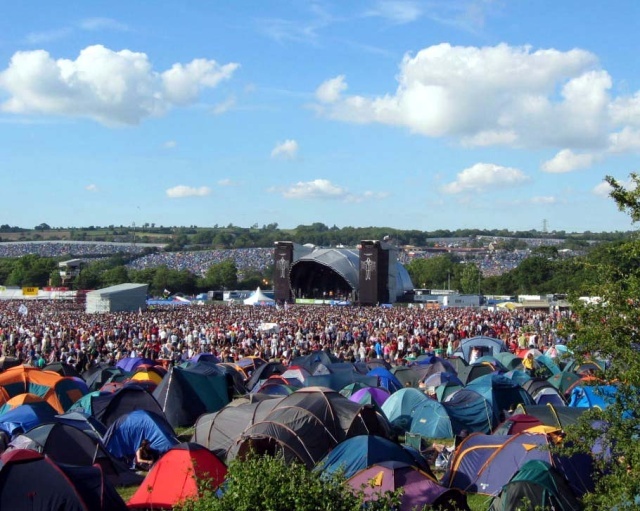 Despite these incidents, 1994’s Glastonbury was as successful as ever, with over 80,000 attending the weekend and acts such as the Manic St Preachers, Elvis Costello, Bjork, Van Morrison and The Levellers playing sets. Ticket prices rose by a respectable £1 – making them £59 a head with programme prices rising to £5. Glastonbury Festival celebrated its 25th anniversary this year, which saw demand for tickets leading the festival to be completely sold out within four weeks of the ticket release date – a landmark event for Glastonbury Festival. The Dance Tent was introduced this year, featuring Massive Attack amongst other acts, which was a huge success. The Stone Roses were due to play this weekend, but pulled out at the last minute to be replaced by Pulp (The Stone Roses would grace the Pilton Show in September, however). Other acts included The Cure, Oasis, Orbital and Simple Minds. The attendance this weekend rose drastically as the security perimeter fence was breached on the Friday – some estimates reckon this may have doubled the size of the festival. Channel 4 again televised the event and huge sums were donated to charity. Greenpeace received £200,000, Oxfam received £100,000 and a further £100,000 was donated to local charities. Ticket prices rose to £65 with programmes remaining £5. There was no festival in 1996. After the outstanding success of the last year’s festival, perhaps coupled with the surge in “trespassers” who breached the fences, the organisers decided to give the farm, the animals, the land and the organisers, ample time to rest and recover. This “recovery year” would become a fairly permanent tradition every five years. “The Year of the Mud”, as described by Glastonbury Festival’s website. ’97 saw torrential rains turn the land into a mud haven as Glasto returned bigger and brighter than ever. The rains and the mud did not deter the majority of the 90,000+ who attended this year’s gathering. This year, Glastonbury was sponsored by The Guardian and the BBC, who took over the televising of the festival from Channel 4. Highlights of this year included a “dubhenge” made from upturned VW beetles and campervans, and the first ever Greenpeace field which featured solar heated showers. The site expanded to 800 acres. Acts across the weekend featured The Prodigy, Massive Attack, Ray Davies, Sting, and Radiohead, who headlined the Pyramid Stage on the Saturday giving a memorable performance. Tickets again rose, this time to £75 although this price included the official programme! This year was a landmark year for Glastonbury, as attendance figures broke the 100,000 mark. From 1,500 attendees at the 1970 festival, Glasto had grown over the years to accommodate over 100,500 attendees in ’98. Once again Glastonbury was hit with severe floods, storms and rains which turned the site into a virtual quagmire. This was the year that I attended as a child, and it was certainly a memorable experience. 1998’s festival saw performances from Pulp, Robbie Williams, Blur, Primal Scream, Bob Dylan and the Chemical Brothers. According to the Glastonbury Festival website, this year saw over 1,000 different performances across 17 stages, including an enlarged Dance Tent. Glastonbury by now was fully established. There were better toilet facilities and even an on-site bank this year round, and over £500,000 from the profits went to Greenpeace, Oxfam, WaterAid and many other charitable organisations. Tickets were £80 (including programme). Glastonbury-goers were treated to a hot, dry weekend this year which saw performances from REM, Manic Street Preachers, Fun Lovin’ Criminals, Fatboy Slim, Hole and Blondie to name a handful. In fact, over 300 bands attended this year’s event with countless theatrical shows, comedy acts, art pieces and other entertainments to be found across the festival. Tickets rose by £3 to a grand total of £83, including a programme, and again Greenpeace, WaterAid and Oxfam benefitted greatly. Over 100,000 attended once more, though the numbers were increased by fence-jumpers. Unfortunately this year’s Glastonbury saw the death of Michael Eavis’ wife, Jean. 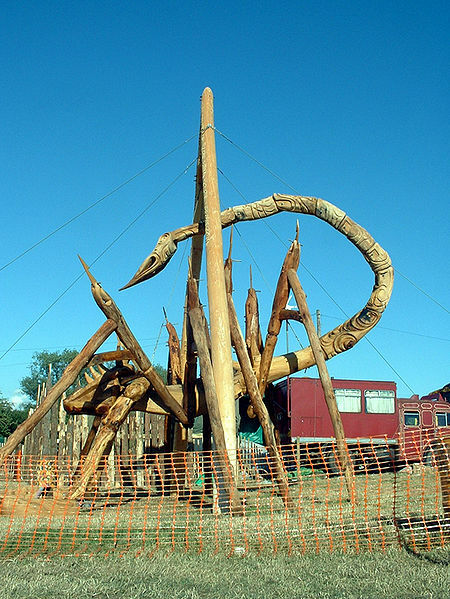 A wicker sculpture was burnt in her memory whilst fireworks erupted in the night sky. The Pyramid Stage returned this year – the third incarnation of the iconic stage which stood 100 feet high. 2000 saw the introduction of The Glade and The Leftfield, as well as increased camping space with the addition of a special family campsite. Playing 30 years after his first appearance, David Bowie graced the festival as a headline act. Other performers included the Chemical Brothers, Basement Jaxx, Moby and the Pet Shop Boys. Despite “only” 100,000 tickets being sold (at £87 a piece), the total attendance of the festival grew to an estimated 250,000 as huge numbers of people jumped the perimeter fences and gatecrashed the event. This led to the absence of a 2001 festival as the local council clashed with the organisers. Due to the large number of gatecrashers at 2000’s Glasto, it was decided that a year should be taken out to assess the situation. In March the Festival was prosecuted for breaching the licensed attendance figures and fined £5,000. It was also fined a further £1,000 for a “noise offence”. This year was spent working on measures to prevent the ever-increasing numbers of gatecrashers to the festival, as well as trying to ensure a safe and secure environment for the festival-goers. 2001 also coinced with the planned festival break every fifth year, so it made sense to hold back the festival this year. A newly devised steel fence prevented non-paying festival-goers this year, which saw the licenced attendance rise to 140,000 visitors. Tickets put on sale in February sold out in weeks, costing a pretty £97 – including programme, which was nice. Acts this year included Stereophonics, Coldplay, Rolf Harris, Fatboy Slim, Roger Walters, Orbital and the White Stripes. 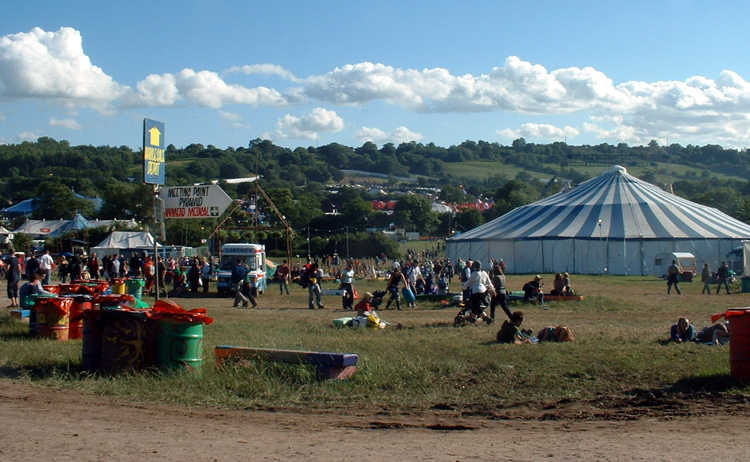 2002 also saw the introduction of the inflatable cinema screen and the surreal Field of Lost Vagueness in the Green Fields, which was a very popular addition. This year was Glastonbury Festival’s fastest selling year in record. Tickets sold out less than 24 hours after release. Brilliant weather, a chilled atmosphere and a great line-up made this one of the “best yet”. Acts included Damien Rice, the Flaming Lips, Moby, Radiohead, REM, The Damned, The Darkness, The Thrills and Bill Bailey. Over 150,000 attended this hugely successful Glasto which raised over a million pounds for charity. Tickets rose to over £100 for the first time reaching £105 per head. This was also the first year that tickets sold out before the full line-up was even announced. Massive numbers of would-be festival-goers were left disappointed as over-demand for this year’s Glastonbury Festival saw tickets sell out in under 24 hours. Glastonbury Festival’s website received two million attempted connections within the first five minutes of tickets going on sale and an average of 2,500 people were on the phone lines every minute. High winds were prevalent in the run-up to the festival but did not dampen the weekend – improved drainage and organisation proved that Glastonbury’s organisers were on top of things this year: indeed, 32% of all waste was recycled and 110 tons of organic waste was composted over the weekend. This year, acts featured included: Paul McCartney, Muse, Oasis, James Brown, Joss Stone, Franz Ferdinand, Television, Scissor Sisters and The Black Eyed Peas. Tickets again rose, this time to £112 (including programme). Once again, over £1 million was donated to Greenpeace, WaterAid, Oxfam and local charities, as well as an additional £100,000 that was donated to the Sudan appeal. This was another landmark year for the ever-growing festival. Tickets sold out in under 3 hours. 50% of all festival waste was recycled. The Dance Tent became the Dance Village – eight different venues all playing different types of dance music, including the Silent Disco. New additions to the experience included The Midnight Cabaret and The Ghost Train in the Circus Field which were hugely popular. And then there was the rain. The opening day of the 2005 festival was delayed by powerful rains that led to flash floods in some areas of the site, with water rising up to four feet! However, the organisers were prepared and the show went on. Performances from Basement Jaxx, the White Stripes, Coldplay, Razorlight, New Order, The Wailers, The Killers, James Blunt, Beautiful South, Babyshambles, Kaiser Chiefs and Elvis Costello brightened the weekend which saw the sun emerging by Sunday to greet cheerful festival-goers. An outstanding £1,350,000 was paid to charity, and 153,000 attended in total. Tickets again rose to £125. There was no festival this year due to the scheduled “year off” for the farm and the organisers. 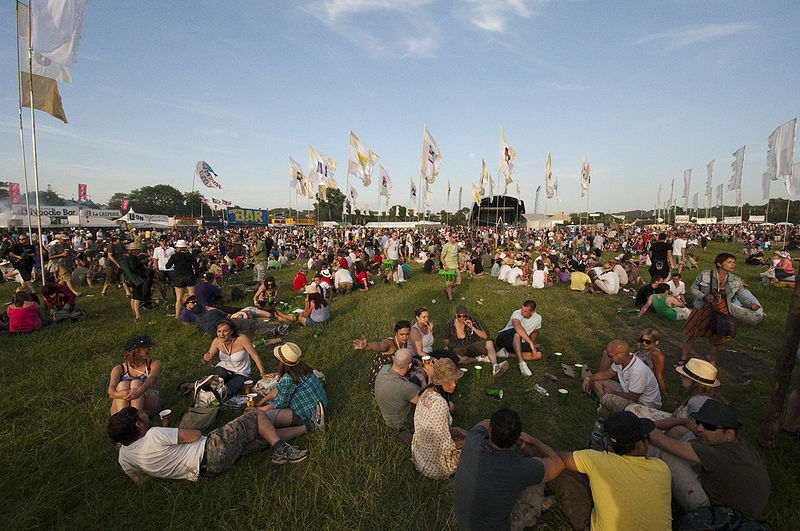 Glastonbury would return, however, in 2007. Another year of pouring rain and mud. The interesting part of Glastonbury Festival is that, no matter what the weather, it is an enjoyable and unforgettable experience. There are always going to be some who leave early or grumble about the mud, but the majority simply do not care. The fields of the festival can transform into thick, heavy mud plains that make traversing the vast acres an actual mission in itself, but that is half the fun. Numerous occasions during a muddy Glastonbury I have found myself walking out of my wellington boot which remains stuck steadfast in the mud, with myself stumbling forwards with a grin on my face. People love the mud, in their own ways. And nothing beats watching a brilliant performance from a headline act whilst the rain pours down and the crowd is singing. You have to experience it for yourself to understand, otherwise it sounds like madness. 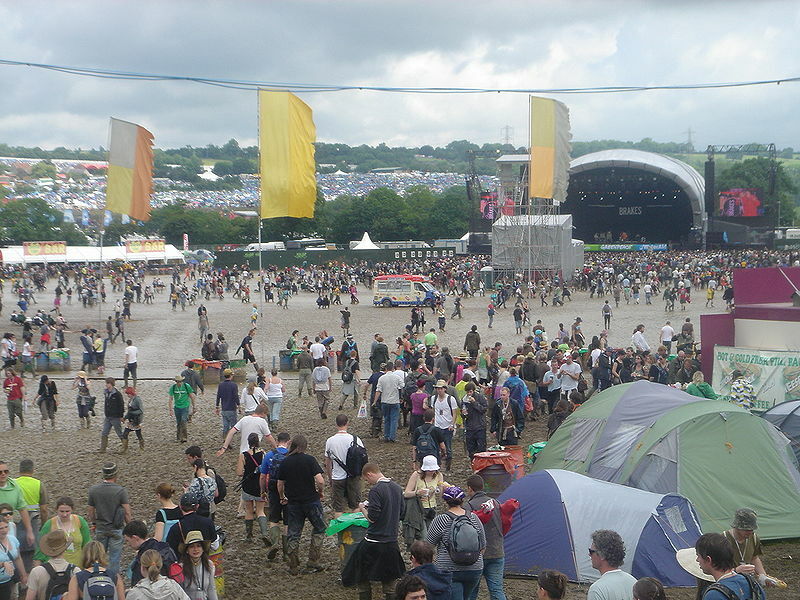 Continually improving drainage and facilities meant that Glastonbury Festival withstood the worst of the rain and sludge. £750,000 was spent on flood defences, meaning that Glastonbury could cope with the worst possible conditions. Over 150,000 attended once again this year, seeing acts such as the The Who (headlining the Pyramid Stage), Iggy Pop, Amy Winehouse, Damian Marley, Lily Allen, The Chemical Brothers, Shirley Bassey and Bjork. The Arctic Monkeys played their first Glastonbury, headlining the Pyramid Stage on the Friday night. Charitable causes joined together for the I Count campaign aimed at addressing climate change. An amazing 70,000 people signed up to the campaign – 46% of all ticket holders that weekend. Tickets, including programmes, were £145 a head. A new emphasis on security was visible this year, however. Upon arrival, many people had their bags searched and the number of arrests rose due to the increased police and security presence. Nevertheless 2007’s Glastonbury was as successful as ever. 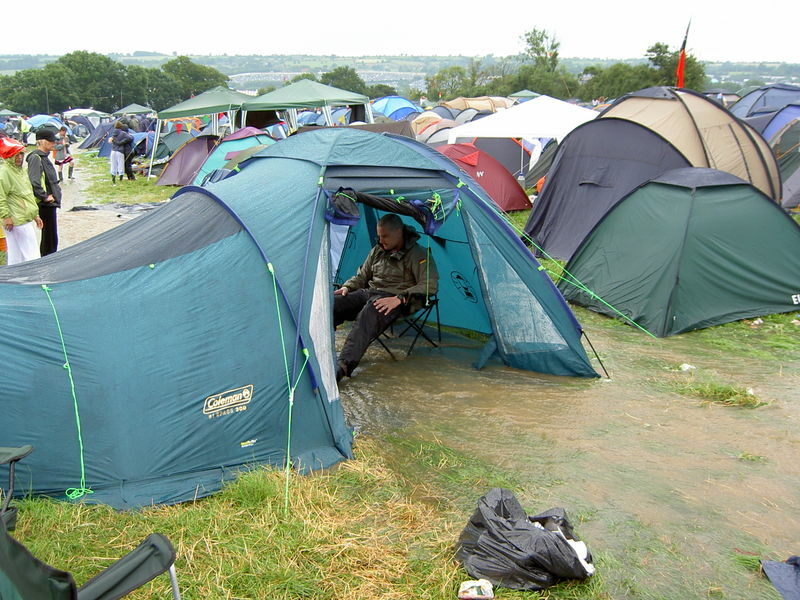 Contrasting to 2007’s wet Glasto, 2008 saw the return of good weather to the now-famous weekend event. Remarkably, tickets did not sell out immediately this year but the weather led to a high demand for tickets as the festival neared and sold out by the time it all kicked off. 2008 saw Solomon Burke, Niel Diamond and Leonard Cohen sharing the weekend with rapper Jaz-Z, The Verve, Massive Attack, Groove Armada, Will Young, Fun Loving Criminals, Kings of Leon, and Katie Melua, to name a few. Tickets rose to £155 but that did not prevent the masses from turning out. A new field was added to the vast acres of Glastonbury Festival nicknamed “Flagtopia” by the festival-goers due to the flags located there. Glastonbury’ Festival’s continual attempts towards green living led it to be awarded The Greener Festival Award for 2008 alongside other festivals also attempting to reduce the environmental impact of the events and to raise awareness for a greener environment. 2009’s Glastonbury was more vibrant and alive than ever before. Shangri-la returned from appearing in 2008, which proved popular as it offered a “retro-futurist virtual world of snaking corridors and neon-gilded surprises”, as the Glasto website describes it. The Festival simply grows from strength-to-strength and each year there are new and exciting additions – you never know what you may stumble across. This year saw more charitable organisaions adding their support to the festival. Michael Eavis hailed 2009 as “the best Glastonbury ever” – not the first time he has made that statement, though few could argue with him on this point. Tickets again rose to £175 but it is difficult to argue when the festival is continually expanding, and offers so much more than many other festivals. The festival’s 40th year. And what a successful run it has been, with no end in sight. On the last night, Eavis sung “Happy Birthday” with headline act Stevie Wonder to mark the anniversary. 2010’s festival sold out within 24 hours and anticipation was high for this year’s weekend. Gorillaz headlined the Pyramid Stage on the Friday night, a replacement for U2 who were forced to pull out. Muse, Stevie Wonder, Faithless, Kylie Minogue, Scissor Sisters, Slash, Lou Reed, Snoop Dogg and The Dead Weather all performed over the weekend with Radiohead’s Thom Yorke and Jonny Greenwood making a surprise appearance with a nine song set. 2010’s festival enjoyed the hottest average temperatures since the early ’90’s with the weekend remaining rain-free. A total of 177,500 attended the weekend and once again huge sums of money were raised for charity. Ticket prices rose to around £185 but this did not deter the thousands who flocked to Glastonbury for the 40th anniversary of what started out as a small festival and has grown to become the world’s largest green-field music and performing arts festival. This entry was posted in Comment, Music and tagged Festivals, Glastonbury Festival, Music, Timeline. Bookmark the permalink. Like this Louis, like the pictures of the Mutiod Waste Company and especially the torrent of water running through the tent! Was there in 87,89,90,91 and 92 (yes I’m old)but shamefully have not been back since. Definitely the best festival around even though Eavis has sold out. Thanks Rupert, those are my favourite images too. I love the way the man in the tent is just staring at the river, unable to do anything about it. Part of the Glastonbury experience, I suppose. You never can predict the weather there. And Eavis has sold out in many ways, ticket prices have risen so much (to cope with the expansion, yes, but still..) and now I believe there are multitudes of on-site banks meaning corporations are creeping into what was originally a backlash to the overly-commercial festivals of the time. However I still believe you’d be hard-pressed to find a better, more enjoyable festival. Remember, 2012 is Glasto’s scheduled year off so try and get a ticket to go this year! Actually in retrospect Glastonbury didn’t happen in 91 so I could have only been there in spirit! I went to Phoenix instead, what a shambles. Riots and fights with security. It was horrible -only good thing was the Buzzcocks. information you offer. It’s great to come across a blog every once in a while that isn’t the same out of date rehashed information.